It’s the season for artichokes and as all Mediterranean people Greeks too, adore cooking this lovely, unique in its taste vegetable. In Greece we usually cook artichokes by combing them with other vegetables in a tomato or lemony-dill sauce. But in many parts of the country they make these incredibly delicious pies out of artichokes. 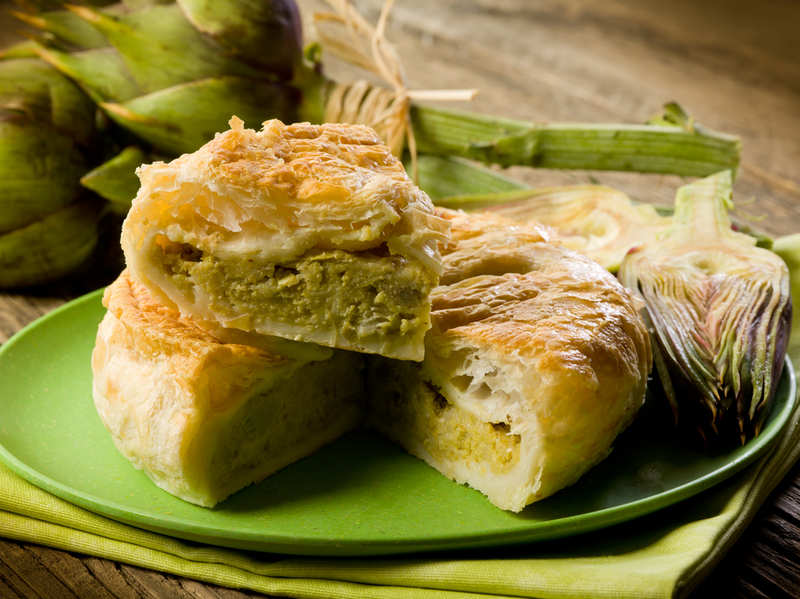 A very delicious artichoke pie is our recipe for today. In a large bowl, combine the chopped artichokes, feta, kefalotyri (or parmesan), dill, parsley, pepper and eggs and stir until mixed well. Add the olive oil and stir again for a while. Set aside. Mix all the ingredients in a large bowl with enough water to make a pliable dough. Knead well. The dough must not stick on hands or sides of bowl. Cover with cling film and set aside to rest for one hour more or less. In the meantime start preheating the oven to 180 degrees. Roll out each ball to the size of a medium oven dish. Place one layer in the oven dish which has already been brushed with olive oil. Spoon the filling evenly over. Top with the second layer. Pinch edges of two layers in order to form a crust around the pie and brush top layer well with olive oil. Spread some sesame seeds if you like. Place in the oven and bake for about 45 minutes or until top layer becomes golden brown. Let cool for a while before serving. This entry was posted in Around the Greek table, THE ART OF LIVING WELL / and tagged artichokes, pies, vegetarian on 6 March, 2015 by George Papageorgiou.